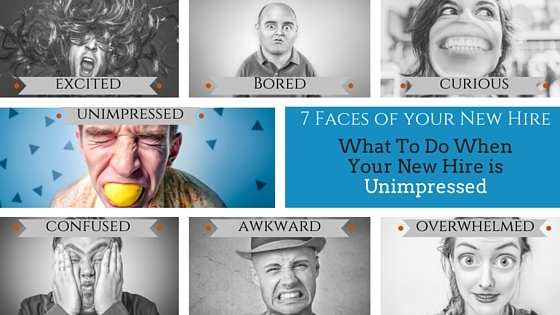 What To Do When Your New Hire Is Unimpressed? Your heart sinks when you look across the office. Your new hire is not looking happy. In fact, it looks like he can’t quite believe what is going on. But not in a good way, like a kid at a firework display. More like a captain watching a sinking ship. That is the face of someone who is worried they have made a really big mistake. He has probably left a good job to join you. This is one of those life decisions he has made. And he is beating himself up because he thinks, right now, that he made a bad one. In this first part of the 7 Faces of A New Hire series, we start with a tough one. An unimpressed new hire is probably the hardest one to recover from. So you need to stop it happening in the first place. Let’s have a look at three reasons why things might have got this bad. 1. Nothing has been organised. Scott is standing at his new desk. Sandra has just gone to find him a different chair because the original one was broken. There are coffee stains on the desk. His new boss is standing next to him, on the phone, chasing up his laptop. There seems to have been a mix up. Fortunately, IT find a spare one in the cupboard to ‘get him going’ although it won’t have everything he needs installed on it. Sandra arrives back with a chair. IT turn up with the temporary laptop. They also request him a password but that is done by a different team and takes two hours to come through. As for his onboarding? Well, he is going to sit with Sandra and watch what she does. By day three he is hoping his new chair will break as it may bring some excitement to the day. How does Scott feel? Well, he feels flat. The excitement he felt in reception on his first day disappeared by lunch (which he ate on his own). He thought long and hard about this job. It looks like he was the only one that did. First impressions are so critical. This is not about you rolling out the red carpet or throwing rose petals at his feet. But you do have to make him feel special. You know what it feels like to start a new job. Think about what you need to do to make this a great experience for him And get it sorted before he arrives. So simple but overlooked far too often. In the meantime, this video and blog post have tips to help you put things in place for his first day. Even with the best planning, things can still go wrong. Do a final check a day or two before he arrives. Any back up plans should be in place before he gets there so at least it is seamless in his eyes. 2. Things are not how they were promised at interview. You want your candidates to be honest at interview. But how honest are you? It can be difficult to find great candidates, particularly when the role is difficult to fill and application numbers are low. And when you finally have a great candidate sitting across from you at interview, it is tempting to sugar coat the reality. But your candidate is making a massive decision based on this. It isn’t fair on him. And he is unlikely to hang around when he understands the truth. The candidate who took the role as there would be less travel than her previous one. Then she finds she will be on the road for three weeks in the next six. No simple answer to this. You just have to be honest. Hiring under false pretences rarely results in a long term employee. And as hard as it is to see a great candidate walk away, it is better that he does it at interview stage. It is a lot less expensive, and less disruptive to the business. Also having people walking out in the early days of a job can damage the company’s reputation as an employer. If you are struggling to fill a particular role, you may want to consider mixing up the responsibilities amongst the teams. Someone may love the travel or customer contact and would happily take more of that. Finally, if people are frequently asking for things that you are not offering, maybe that is a sign to start looking into how you can. As a hiring manager, has this happened to you? You felt like you had been really honest with your candidate at interview. (Maybe you had been burnt by point two before). Thinking back you did have a slight concern that he wasn’t taking it all in. And that maybe he was hearing what he wanted to hear. And now he has started and he is talking to you about the job he thought it was that you don’t even recognise. You are not sure how to fix this one because the only place the job he is talking about exists is in his head. Look at your selection process. How much exposure do your candidates get to the people that are actually doing the job? Give your final round candidates some time with their future colleagues. And then sit down with them again and find out what they learnt about the role. Listen to the relevance of the questions they ask. Get the opinion of your existing team member as to how well they understood what he did. If your candidate’s current company is very different to yours then spend some extra time on this. For example, moving from a big multinational to a small start up or switching from one industry to another can be huge. And if you don’t spend time with them setting expecations, the ones that they create can be widely off the mark. Take time at interview to be sure that they know what they are getting into. Can you turn an unimpressed new hire into a happy employee? We’ve all heard stories about the disastrous first date that ended in a happy marriage. And the online dater that still found love despite the claims of his yacht on the Mediterranean turning out to be a rowing boat in Swanage. So there is always hope. Just don’t ignore the signs and hope it will get better. Speak to your new hire and understand the issue. If his first few days were less than impressive, plan out what you can do from this point that will change his opinion and implement it now. If the job is not what was expected, for whatever reason, you may need to think creatively. A great hire can be hard to find and you should look at ways to keep him in the company even if you can’t keep him in that job. 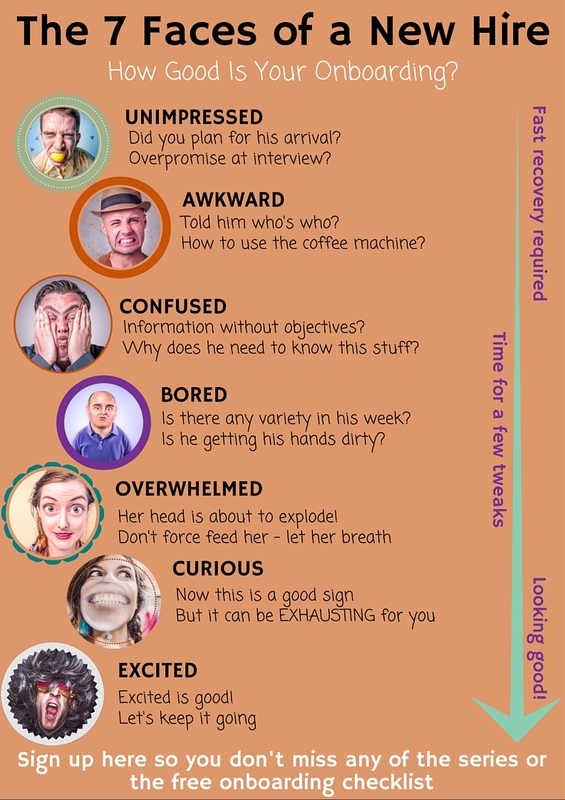 Don’t want to miss any of the’ Seven Faces Of Your New Hire’ series? Sign up here and you’ll get them in your inbox as soon as they are published. You will also get the checklist for an onboarding experience that will make your new hires look like they have just won the lottery! Here’s what’s coming up in the rest of the series.